Cacio e pepe is my sick food. As a child, this is what my momma would make me whenever I was feeling under the weather: a bowl of buttered noodles covered in a dusting of grated parmesan and a little pepper. The ultimate comfort food and simple enough to remedy just about any illness. The same generous bowl of parmesan noodles is what I now make for BL (and myself) whenever we are sick, and I know I’ll be serving it to Van the first time he’s got a cold. What’s not to love about this dish? It’s essentially three ingredients that come together to create a simplified version of mac and cheese. But don’t let the simplicity fool you. There are a few tips and tricks to creating the perfect mound of cacio e pepe. And hey, If it can work for spaghetti, I think it can work for spaghetti squash. I fell hard for cacio e pepe when I was in Rome last Fall. I’m fairly certain in our 5 days there I ate it at least once a day. It’s much lighter than Alfredo, simpler than mac and cheese and more elegant than plain buttered noodles. First, cook the spaghetti squash. I like to place my squash in the microwave for a minute or two before slicing. This allows the skin to soften just enough to be easier to cut through. Then rub it generously with olive oil and salt/pepper and place in the oven to bake. Remove the strands with a fork and place in the skillet along with cooked garlicky kale. Yes, I know I’m changing the recipe completely by adding kale, but we’ve already swapped in squash for noodles! What’s one more vegetable? Plus, the texture complements the squash perfectly. I prefer freshly grated parmesan here as you want it to almost melt into the pasta. Start with 1/4 cup at a time along with a little vegetable broth to pull everything together. Toss, toss, toss, then add a bit more cheese. Keep going until it’s the consistency that you want, then serve hot. 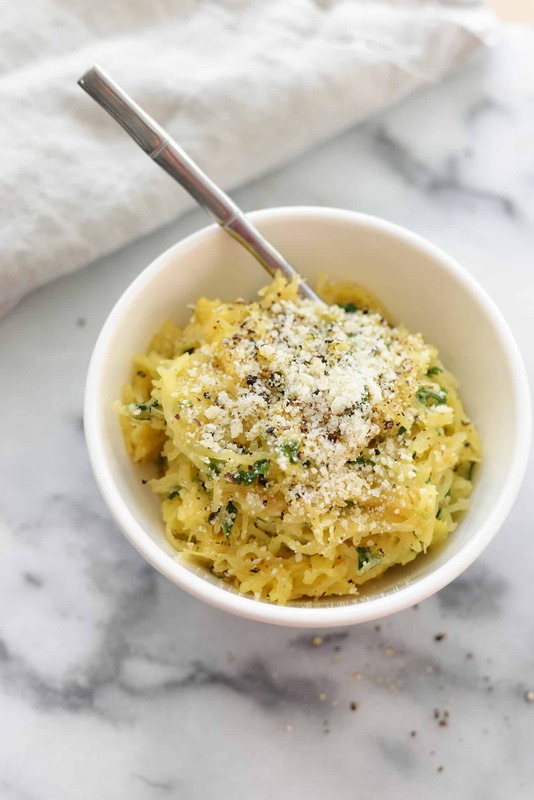 Spaghetti Squash Cacio e Pepe! 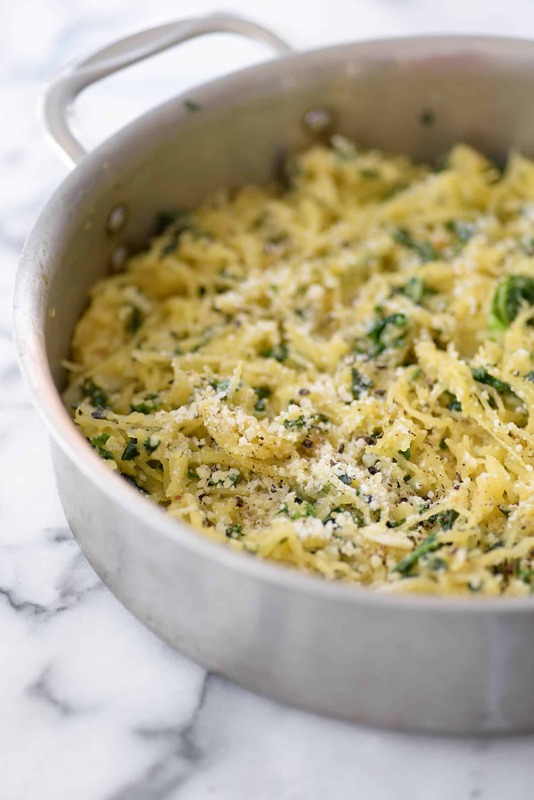 If you like cacio e pepe (cheese and black pepper pasta) then you’ve gotta try this grain-free, vegetable version with spaghetti squash and kale. Preheat the oven to 400 degrees F. Drizzle olive oil over the cut sides of the spaghetti squash and sprinkle with a pinch of salt and pepper. Place cut side up on a baking sheet and roast for 35-45 minutes until squash is just tender enough to scrape into strands. While the squash is cooking, heat 2 tablespoons butter over medium heat. Add the garlic and cook 1-2 minutes, stirring continuously, until garlic is just soft taking care not to burn. Add the kale and cook until tender. Scrape the spaghetti squash into strands and toss with the kale. Add the vegetable broth along with the remaining 2 tablespoons butter and 1/4 cup grated parmesan cheese and black pepper. Toss continuously until cheese is melted. Add more cheese, in 1/4 cup increments, tossing the entire time. Season to taste, adding more black pepper and salt as needed and serve very hot. Don’t stress over the amounts of spaghetti squash and parmesan cheese. These are rough estimates, so if you have larger squashes, you’ll just need to add more cheese and a few splashes more of vegetable broth. Since you typically use pasta water to help adhere the cheese to pasta, you’ll need the vegetable broth so that the cheese creates a sauce and the squash isn’t too dry. 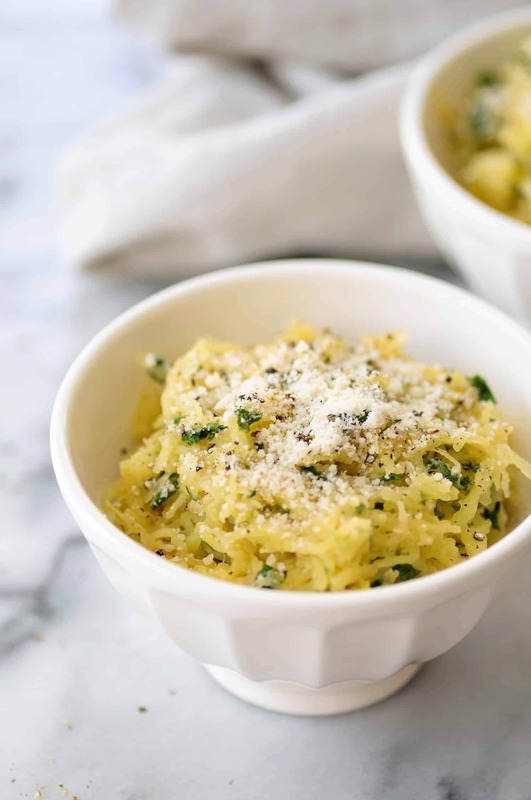 Cacio e pepe spaghetti squash sounds dreamy! Can beat the simplicity of it and so big on flavor! I love how simple this! I haven’t been a spaghetti squash with tomato sauce fan, but I really think I’d like it this way! Thank you! OK Cacio e Pepe is one of my absolute favorite meals. So simple, yet so delicious. I love, love, love this healthy version! Brilliant! That, right there, is a bowlful of pure, clean comfort. Traditional mac and cheese can’t hold a candle to this approach! Speghetti squash cacio have very best taste, i tried it last time. This looks so good! I am pregnant and all parmesan cheese that I have found is raw milk. Do you have any other recommendations for a substitute for parmesan cheese? Thank you! Yes! Though, the traditional recipe also doesn’t include Spaghetti Squash 🙂 I like parm because I can find a vegetarian parm in my Whole Foods. You can use pecorino Romano if you try this recipe! Will this recipe freeze and reheat well? Any tips on making this ahead of time? I haven’t tried freezing it; I’d be worried that the squash would hold onto too much water.